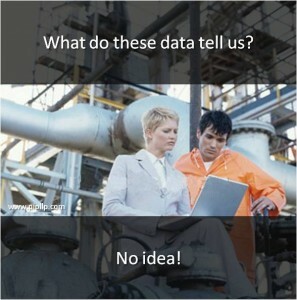 The refinery management had the same problem – Plenty of data but they have no idea what to do with it. This got me thinking about how the modern world is increasingly relying on “smart” products to make our lives easier and our homes more efficient. Millions of people own a smart phone that tells them when they have received emails, reminds them of appointments, gives directions, and even translates foreign language signs. Whatever the device or application, smart products all have one thing in common: they collect and process data to predict what the end user needs. This is not generally happening in refineries where, in the modern world of “smart,” they seem to be very much behind the times. The main reason is that technology can only be smart if it is used smartly. For example, if you don’t know how to use all the functions on your smart phone, it is just a mobile phone and nothing more. Applying this rationale to a refinery, which has a range of high-tech systems for gathering data from the plant, then it is the capability of the operators and management in handling the data and extracting useful information that will make the refinery “smart” and able to outperform all others. The problem is that filtering through such data is not an easy task. That’s where experienced engineers and consultants can offer help and guidance. At Palmer International Partnership LLP, we review and extract data from refineries based on the fundamentals. This unique methodology allows us to connect the dots to address specific plant weaknesses and exploit specific refining capabilities. Today’s technology enables us to measure and capture a level of data which was not possible a few decades ago. So, it is up to us as operators, engineers, consultants, plant managers and refining managements to understand the fundamentals of the refinery and utilise these data fully in order to maintain a competitive edge. For more information about our methodology of finding smart projects, feel free to contact us.